•	This year has seen the successful launch of six issues - increasing frequency to EIGHT issues in 2012 (September and October issues will be single issues). 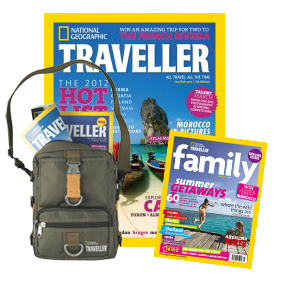 •	Launch of the www.natgeotraveller.co.uk website in April 2011. •	Two awards for best features - Emma Gregg’s Namibia story won the British Guild of Travel Writers’ best long-haul feature and Andrew Eames won the German National Tourism Office’s Travel Writer of the Year Award for his ‘It’s Germany but not as you know it’ feature. Plus nominations for best consumer magazine and best young writer at British Travel Press Awards. •	Superb subscription offers over the course of the year: From £9.99 (for six issues) to £11.90 (seven issues); free gifts (a rucksack/across the body bag) while stocks last; and the chance to add the two special issues of National Geographic Traveller – Family for just a £1. All current offers are inside the magazine! National Geographic Traveler (USA) is the world’s most widely read travel magazine. It championed sustainable travel before it was cool and, eight times annually, celebrates journeys that are about place, experience, culture, authenticity, living like the locals and great photography. It makes a distinction between tourism and travel and stresses inquisitive, not acquisitive, trips. It employs storytelling and you-are-there photography to inspire readers to pick up and go. And, with the theme of “All Travel, All the Time,” it eschews fashion and fluff in favour of articles that offer a strong sense of place, inspiring narratives that make readers take trips, and solid service information to help them plan those trips. This press release was distributed by ResponseSource Press Release Wire on behalf of APL Media (Absolute Publishing) in the following categories: Entertainment & Arts, Leisure & Hobbies, Travel, Media & Marketing, for more information visit https://pressreleasewire.responsesource.com/about.